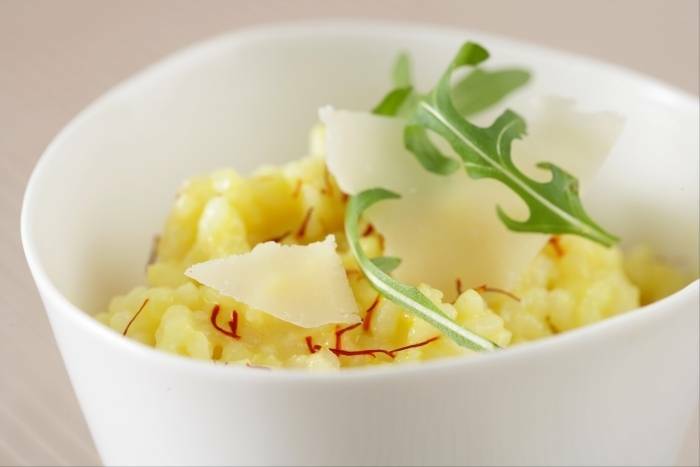 A simple saffron risotto that works well with veal, fish or osso bucco. Peel and finely dice the onion. Sweat in a saucepan with a drizzle of olive oil and a pinch of salt. Add the rice to the pan and cook for 1 minute, stirring to coat the rice in olive oil. Once the rice is translucent, deglaze with the white wine. Allow to reduce then add a ladleful of stock. Add the saffron threads and cook gently until all the liquid has been absorbed then add another ladleful of stock. Repeat this process until the rice is cooked through and all the stock has been incorporated - this should take approximately 15 to 17 minutes. Add the butter and parmesan to bind the risotto, adjust the seasoning and serve immediately.